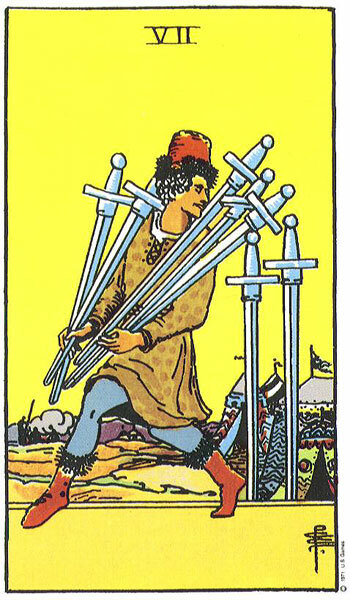 The Seven of Swords can mean different things in different situations, but is always a card to note – particularly if you are in the midst of a difficult conversation or a negotiation. 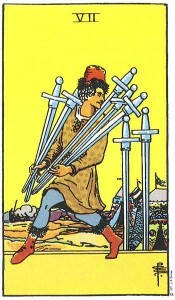 As the nimble, sly trickster scoops of swords and steals away in the night, we are reminded of the dual-edged nature of the card. It can mean trickery, deceit or wrongful actions (either on the part of the querent or against the querent) – but it can also mean quick thinking, new strategies, or brash thinking to save the day. 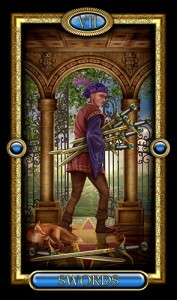 In a reading: Drawing the Seven of Swords is a warning to pay close attention to your conversations and negotiations. Quick thinking and sudden action may be required to achieve your goals.